Time to put the video games on hold. Turn off the television and close the laptop while you’re at it, because the outdoors is calling. The adventures your youngster will experience outside the house are far more exciting than the ones on the screen. All you need to do is provide some motivation. Don’t worry, it’s easy to generate excitement for Mother Nature. Your kids will love the hiking, climbing, and exploring that accompanies a trip to the forest, mountains, or lake. You won’t even have to venture far to create a pleasurable and memorable outing with your children. A switch from the technology-oriented everyday grind is a learning experience that is sure to stick with them. With planning and some promotion, you can take a fun, educational, and unforgettable journey to your backyard. While the goal is to introduce your kiddos to the wildlife around them, supporting the escapade with a little technology can enhance the process. 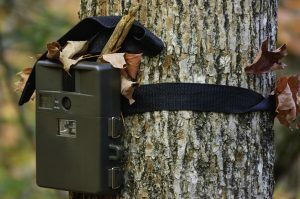 Something as simple as using hunting cameras to document the voyage, capture rare occurrences you might not otherwise, and penetrate a genre of life typically not accessible to humans can help boost excitement for a trip. So gather up the kids and get started. There are plenty of ways to get your squad to love the outdoors. How many animals have your little ones seen in books or on television? Now how many have they seen in person? There is quite a difference. Good thing that your hunting camera isn’t just for capturing a few silly moments with loved ones. Set up a trail cam at night to capture nocturnal animals. Keep it charged for daytime use to discover species that only venture out when the coast is clear. Your youngsters will certainly find a worldwide variety of animals more interesting than the World Wide Web. A few clicks of a lens are enough to change the perspective of an adult, let along the outlook of a child. No sport is as basic and natural as hunting. Whether you’re tracking a small species or looking for big game, the thrill of bringing back a trophy catch is a rare and valuable thing. Check out your hunting camera daily to see what animals are lurking near your campsite. You never know, a world record buck could be just feet away from where you sleep. Of course, you’ll want to secure the proper licenses and stress safety first; plus your kids need to be old enough to understand, and be interested — not all will be. But, after explaining the basics, watch your kid’s face light up with excitement. You´re kids will love exploring the woods and waiting for pray. You won´t need to worry about wondering too far or getting lost, because with iTracking, you´ll be able to locate your car without trouble. It will be different than scaling steep trails with your buddies, but it also may be more rewarding. Teach your little ones about the flora and fauna while showing them some spectacular views. You may need to adjust your goals and have some flexibility, but it will be worth it. 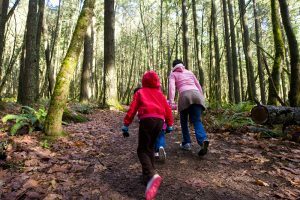 Hiking is a great way for children to sharpen their observation skills, teach them patience, and help them push themselves. Just be sure not to overdo it. Much like hunting, fishing is a natural sport. It takes little effort and is a great bonding experience. There’s no more relaxing place than on a boat on the lake or a shore by the river. Be advised, this may only work well for older children. Rock climbing is the grown-up version of a jungle gym. Climb, jump, and run around the biggest boulders on earth while you offer grip support and grappling strategies to your kids. Great for the whole family, geocaching is a treasure hunt that is as fun as you make it. Select a difficulty level and a type of search. You can spend all day roaming around nearby areas you never even knew existed. If you’re on a tighter schedule, pick a faster cache that still delivers loads of fun. Taking on the rapids on a hot summer day is about as refreshing as it gets. Exert some energy, float down the river, and have a great time with family when you schedule a rafting trip. Any activity on this list is a great way to spend time with your children, but biking may be the best of the bunch. There are few better exercises and few activities as family oriented as biking. Trails dot every county, state, and national map you can find. So, buy or rent a two-wheeler today and get started.